Relative sizes of the known habitable zone planets identified to-date. Today, we met the neighbors. NASA astronomers announced that the Kepler mission has discovered three earth-like planets orbiting distant stars and which are within the 'habitable zone' -- where distances from the sun-like star maintain temperate surface temperatures that maintain liquid water. Key to the planet-hunters' spotting is the Kepler spacecraft. NASA's Kepler space telescope has one primary sensor that detects the light of hundreds of thousands of stars all at once. If a planet passes between our Solar System and a distant star, the sensor registers a tiny dip in the star's brightness. By studying the pattern of dips, researchers can determine how long it takes for the planet to orbit its sun. Two of the newly uncovered planets orbit around a star called Kepler-62, about 2,700 light-years away. As far as suns go, Kepler-62 is a smaller, dimmer star than our own. One of the planets, charmingly named Kepler-62f, is a mere 40 percent larger than Earth, closer in size than any other planet known to orbit within the habitable zone of a star. 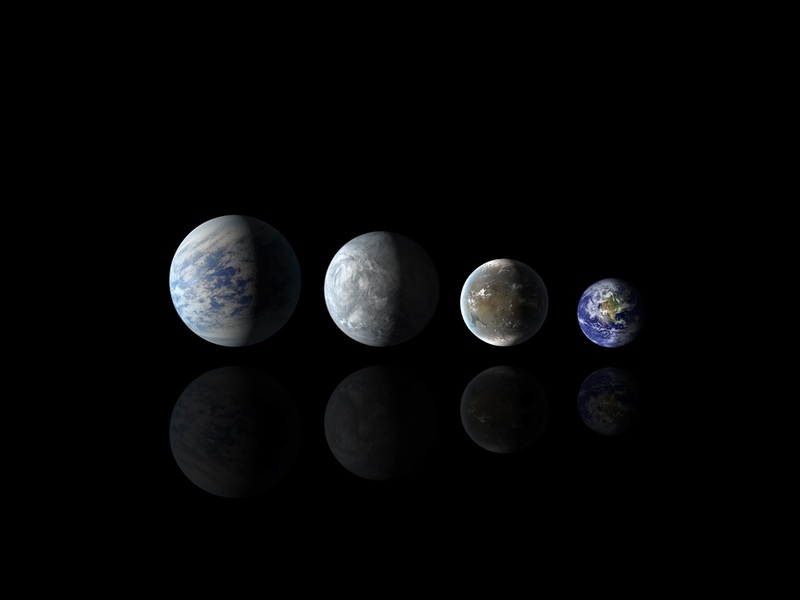 It's neighbor, Kepler-62e, lies on the hot inside edge of the habitable zone and is about 60 percent larger than Earth. The second planetary system, Kepler-69, is similar in size and brightness to our sun and much closer at only 1,200 light-years. That's why astronomers believe that the third exoplanet, Kepler-69c, with a orbit of 242 days similar to Venus, might have a similar surface composition. In their report published in the journal Science on April 18, 2013, the researchers say that while the Kepler telescope enables unprecedented access to search for the earths of the universe, the data from Kepler isn't sufficient to determine the surface composition of the planets. Instead, the researchers compare factors like orbit time, size, and brightness of the planet's sun to planets closer to home to imagine the planets' land. In the meantime, the Kepler telescope has kept scientists busy. Since its launch in 2009, the telescope has detected over two thousand candidate exoplanets, 122 of which have been confirmed. To keep track of the hunt for distant earths, check out the exoplanet database.